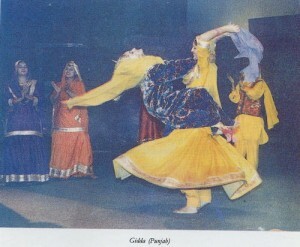 The menfolk of Punjab dance Bhangra while the womenfolk perform Gidda. If is performed on all happy occasions like marriage and childbirth. The ceremonial Gidda, however is danced for consecutive twelve days in the month of July when the festival called Teejan of Sawan is held. The dance consists of singing, clapping, and enacting the Boli, which is one or two couplets that narrate a very wide range of subjects from household chores to the tensions between mother-in-law and daughter-in-law: The singing of the Boli is punctuated with an enthusiastic refrain-phrase Balle, Balle. To perform Gidda the dancers form a circle and participants in pairs, take turns to come to the center and sing the bol. Towards the end of the boli the pair dance with gay abandon and then return to the circle. Another pair replaces them. Thus the dance may continue for hours. Often the dance is accompanied by a Dholak played by one of the women participants. At times it is danced only to the clapping. Gidda is uniformly popular in Punjab, however, the Gidda of Malwa area is famous for its gusto and speed.